Few process maps stand alone. Any given set of processes that make up an application or project needs to be connected. This need can be met by creating a simple to read flowchart known as a “dashboard”. 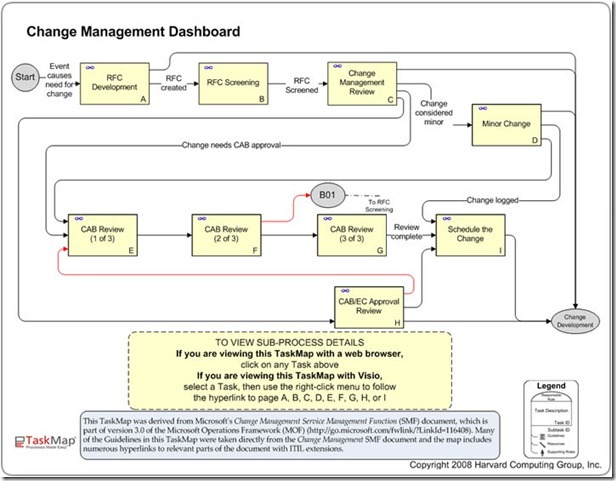 The example above illustrates how a complex process project, such as Change Management can be simplified by using a dashboard as a navigation guideline. It dramatically simplifies access to the information, shortens learning curves, and makes it easy to update and change the information quickly and easily.